Quantities of hazardous waste are increasing. As hazardous waste contains substances harmful to the environment, it has to be collected, recovered or deposited separate from other waste. In 2009, 99.3 thousand tonnes of hazardous waste was generated, which was a 47% increase from 2002, while on the other hand, it was a 36% decrease from 2008, which was the year in which, due to extraordinary events, the largest quantities of hazardous waste in recent years were generated. 47% of hazardous waste was recovered and 53% deposited in 2009. Hazardous waste has one or more hazardous characteristics which are harmful to health and/or the environment (e.g. flammability, irritancy, toxicity, mutagenicity, oxidizing properties, infectivity, etc.). Mandatory management of hazardous waste is specified in the Decree on waste management (Official Gazette of the Republic of Slovenia, No. 34/08). The Annex to the Decree contains a list of hazardous waste including the list of properties due to which such waste is classified as hazardous. - households where hazardous waste can be delivered to collection facilities operated by local public utitlity services responsible for collection and transportation of municipal waste or handed over twice a year during the collection of hazardous waste from households. Generators from households can also hand over certain types of hazardous waste to distributors (small portable batteries, car batteries, electric or electronic equipment, etc.). · To achieve, in the years to follow, at least 1 kg of collected hazardous fractions per capita per year within the operation of the local public municipal waste management services. Hazardous waste requires a stricter regime of control than non-hazardous waste, as it poses a risk to the environment and human health. For this reason, it must be collected, deposited, recovered or destroyed separately from other waste. Hazardous waste is generated in industrial, trade and agricultural production and processing as well as in households (e.g. solvents, paints and dyes containing hazardous substances, pesticides, fluorescent tubes and other waste containing mercury, paints containing hazardous substances, certain medicines, motor vehicles, etc.). The total quantity of generated hazardous waste is gradually increasing. This is partly thanks to improved collection following the implementation of regulations adopted in 2003 and 2004 for the management of certain types of waste, and partly due to a greater number of persons liable to report. Since 2004, quantities of hazardous waste have been higher due to a change in methodology (e.g. construction waste containing asbestos became classified as hazardous waste). In 2005 and 2008, quantities increased considerably due to extraordinary events. The most significant contribution to the growth in the quantity of hazardous waste was observed in construction and demolition waste (group 17), but most hazardous waste is generated from organic chemical processes (group 07). In 2009, 99,300 tonnes of hazardous waste were generated in Slovenia, which was 47% more than in 2002, but 36% less than in 2008 when the largest quantity of hazardous waste in recent years was generated, of which 95,676 tonnes were hazardous waste from manufacturing and service activities and 3,577 tonnes were municipal hazardous waste (1.75 kg per capita). In total, 61% of hazardous waste was recovered and 39% was disposed of in 2008. Most of hazardous waste (42,000 tonnes or 49%) was recycled, 22,000 tonnes (26%) was landfilled, 12,000 tonnes (14%) were incinerated and 8,000 (9%) tonnes were used as fuel. Compared to 2007, the share of hazardous waste deposited as landfill slightly increased, while the share of recycled hazardous waste slightly decreased. According to the Eurostat data, the quantity of hazardous waste has been increasing in most EU Member States. Also, methodology issues regarding the determination of hazardous waste quantities and their comparability have been raised at the international level. The goals set forth by the environmental legislation in Slovenia are aimed at putting the flow of hazardous waste under control. Future strategic and legislative approaches need to address the reduction of risk throughout the entire life cycle of products, from planning to waste management. 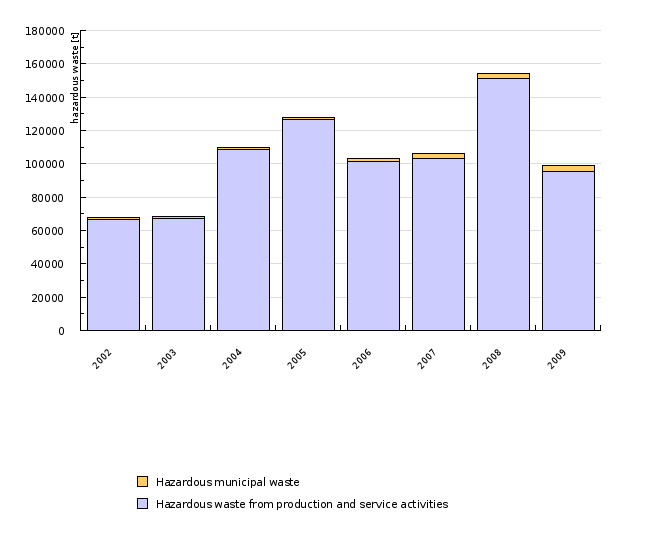 Source database or source: Analysis of waste management annual reports; Waste Management Documents, Slovenian Environment Agency. Data administrator: Slovenian Environment Agency. Methodology and frequency of data collection for the indicator: Data have been captured for the 1999-2008 period. Data is collected annually. In principle, the system for the acquisition of data on waste generation and management is prescribed by the Environment Protection Act (Official Gazette of the Republic of Slovenia, No. RS 39/06), and specified in detail in the Decree on waste management (Official Gazette of the Republic of Slovenia, No. 34/08); Article 15 of the Decree stipulates mandatory annual reporting on the quantity of generated, collected, recovered or deposited waste by all entities who generate more than 5 kilograms of hazardous waste per year. Reports on the quantity of collected, recovered or deposited waste must be written on special report forms to be submitted by all persons authorised to be engaged in waste management: generators, collectors, recoverers and disposers of waste. The inventory comprises all hazardous waste from the waste catalogue (marked with asterisk), which are generated on the territory of the Republic of Slovenia at least in the specified annual quantities. - the recoverer and disposer of hazardous waste must deliver a report on hazardous waste recovery performed in the previous calendar year. The liable entities must send the above reports no later than 31st March of the current year on the form prescribed by the Slovenian Environment Agency. In 2003 some modifications were introduced in reporting methodology: some changes were made regarding the classification in the waste catalogue and certain wastes were reclassified from non-hazardous into hazardous waste. The Statistical Office of the Republic of Slovenia reports on both the quantity of generated hazardous waste and the quantity of generated of hazardous waste including inventories. 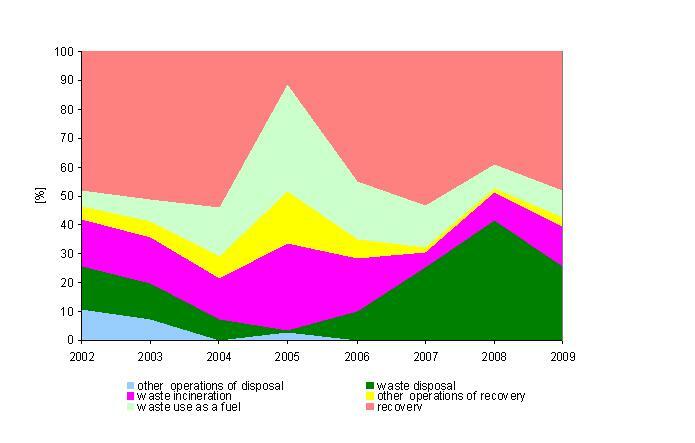 Data processing methodology: Figure OD3-1 shows the total quantity of generated hazardous waste for the 1999-2008 period (in 000 tonnes). Data on quantities of recovered and deposited hazardous waste presented in terms of treatment (recycling, incineration, depositing, …) are converted into shares and presented in Figure OD3-2. 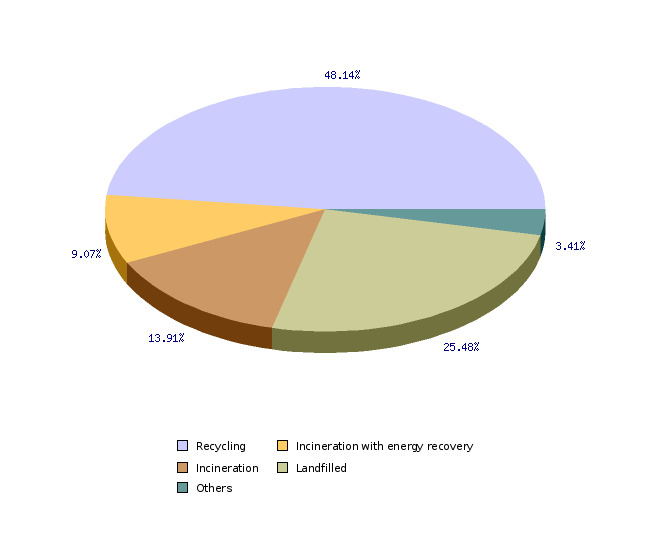 Figure OD3-3 presents the percentage shares of hazardous waste treatment (recycling, incineration, depositing, …) in 2008. - Advantages and disadvantages of the indicator: The waste catalogue, on the basis of which the liable entities report on the quantity of individual types of waste was modified in compliance with the amendments of European legislation in 2001. Some further modifications were introduced in 2003. The submitted reports are entered into the database. The Agency checks if all liable entities have submitted their reports and missing reports are submitted. In case of irregularities or failure to report, the data are verified and reconciled with each liable entity.